In complex adaptive systems like modern financial markets, a change the price of any one market has a spillover effect into other markets. One of the best understood and most straightforward of these intermarket relationships is the impact of the US dollar on US stocks. 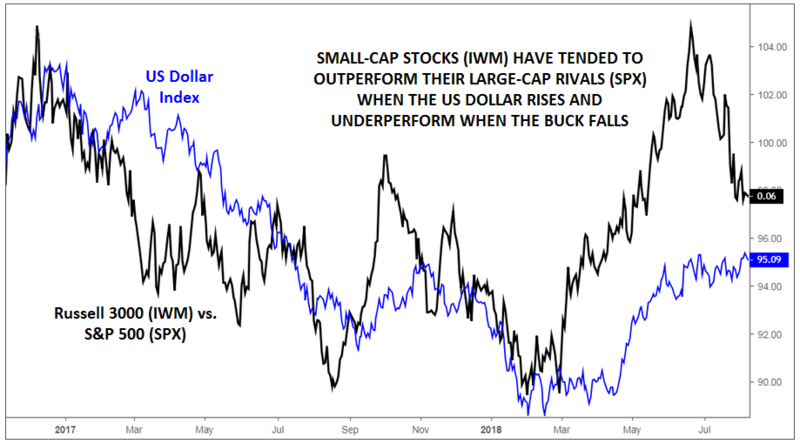 In short, a strong dollar tends to boost the performance of domestic stocks at the expense of foreign rival, as well as the performance of importers at the expense of exporters. Intuitively, fluctuations in the value of the dollar directly impact the returns that US investors see on the foreign stock investments. To take a trite example, if the UK’s FTSE index rallies 20% in a year in local currency terms, a UK investor would see the value of his holdings (in pound sterling) rise by 20%. However, if the value of the dollar also rose by 10% against the pound over the course of the year, a US investor’s return on his FTSE investment would be closer to 10%. Of course, corporate executives are well aware of this connection. As an example, FactSet found that two-thirds of the companies in the Dow Jones Industrial Average cited foreign exchange as a headwind for their earnings in Q3 2018, following a sharp 9% surge in the value of the dollar index over the last six months. As you can see, it’s critical that global stock investors monitor FX market fluctuations, even if they’re not trading FX directly themselves. 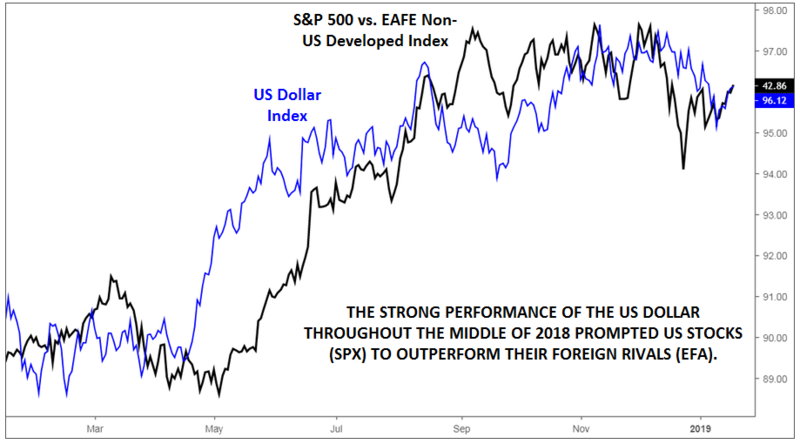 Even for investors who trade exclusively domestic stocks, the foreign exchange market can have a major impact. Given the economy’s global nature, businesses are increasingly coordinating (and competing) with rivals across oceans, not just in the next town over. Fluctuations in the FX market have a direct business impact on the operations of importers and exporters. If the value of the dollar rises relative to its rivals, the dollar cost of foreign imports falls. For companies that are net importers, this directly decreases expenses, increasing margins and by extension, profits at such firms. The converse occurs with net exporters: a rising dollar makes their goods more expensive for foreign buyers, forcing the company to either cut prices or see sales decline. In today’s global economy, trading stocks without at least a cursory knowledge of developments in the FX market is akin to driving with one eye closed. On the other hand, experience trading one market can give readers a big leg up in learning to trade the another.